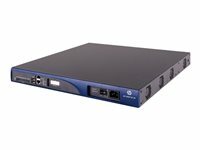 The HP MSR30 Router Series is a family of high-performance medium-to-large branch routers that deliver integrated routing, switching, security, wireless, and voice in a single box. 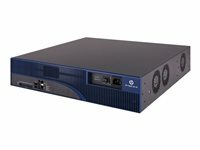 With its integrated infrastructure and modular design, the MSR30 reduces complexity and simplifies your network while enabling faster time to service and enhanced performance. The MSR30 increases flexibility and agility by delivering support for a wide range of virtualized applications on the Open Application Platform module. 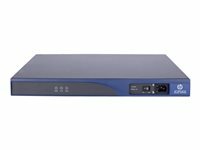 With 4G LTE and UC&C support, it offers dependable branch survivability and resiliency. 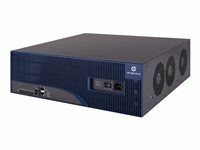 Features: The HP MSR30 Router Series simplifies your network through integrated routing, switching, wireless, encryption, VPN, firewall, voice and virtualized applications. Reduce Complexity and Simplify Your Network The HP MSR30 Router Series simplifies your network through integrated routing, switching, wireless, encryption, VPN, firewall, voice and virtualized applications.Reduces your TCO through open standards, power and space savings, and energy-efficient hardware.Single pane of glass management with HP Intelligent Management Center makes administration easier.Zero-touch deployment and Dynamic VPN reduce management complexity.No additional licensing complexity or cost for advanced features. Increased Flexibility and Agility Across Your Network The HP MSR30 Router Series supports an Open Application Platform module for HP AllianceOne applications such as WAN acceleration and Microsoft Lync.Fully modular platform and wide range of connectivity options enables the right design for your needs.A rich host of modules for WAN, LAN, voice, and virtualized applications reduces costs and complexity.Based on open standards for ease of network integration. Enhanced Time to Service and Branch Performance The HP MSR30 Router Series gives your medium-to-large branch offices high performance routing with up to 360 Kpps forwarding to meet bandwidth-intensive applications demands.High density voice interfaces and embedded service modules provide enhanced integration and faster time to service.Comprehensive feature set enables branch services that support your needs.Integrated security eases the transition to the cloud. Strengthen Medium-to-Large Branch Resiliency and Survivability The HP MSR30 Router Series with 4GE LTE and 3G WAN access support enables service survivability.Support for modules like the HP MSR Survivable Branch Communication Module (SBM) powered by Microsoft Lync enables realtime communications, even when the WAN is unavailable.Advanced hardware architecture and FPGA modules increases the dependability of your network. Resiliency and high availability Backup Center: acts as a part of the management and backup function to provide backup for device interfaces; delivers reliability by switching traffic over to a backup interface when the primary one fails.External redundant power supply: provides high reliability.Virtual Router Redundancy Protocol (VRRP): allows groups of two routers to dynamically back each other up to create highly available routed environments; supports VRRP load balancing. Layer 2 switching Spanning Tree Protocol (STP): supports standard IEEE 802.1D STP, IEEE 802.1w Rapid Spanning Tree Protocol (RSTP) for faster convergence, and IEEE 802.1s Multiple Spanning Tree Protocol (MSTP).Internet Group Management Protocol (IGMP) and Multicast Listener Discovery (MLD) protocol snooping: controls and manages the flooding of multicast packets in a Layer 2 network.Port mirroring: duplicates port traffic (ingress and egress) to a local or remote monitoring port.VLANs: support up to 4,094 port or IEEE 802.1Q-based VLANs.sFlow: allows traffic sampling. Layer 3 services Address Resolution Protocol (ARP): determines the MAC address of another IP host in the same subnet; supports static ARPs; gratuitous ARP allows detection of duplicate IP addresses; proxy ARP allows normal ARP operation between subnets or when subnets are separated by a Layer 2 network.User Datagram Protocol (UDP) helper: redirects UDP broadcasts to specific IP subnets to prevent server spoofing.Dynamic Host Configuration Protocol (DHCP): simplifies the management of large IP networks and supports client and server; DHCP Relay enables DHCP operation across subnets.